August will remain in the memory of many Bangladeshis for three political tragedies from three separate years. Some might suggest it would be unfair to look for any similarities in the three shocking events that occurred in three different times. Despite the possible criticisms, a novelist can find enough content to write a trilogy based on the three bloody incidents of August 15, 17 and 21. The first of the three incidents was the killing of the nation's founding father and the first president Bangabandhu Sheikh Mujibur Rahman in 1975. The second was the horrific political terror attacks in 2004 that tried to kill Awami League President (now premier) Sheikh Hasina, Mujib's daughter. And the last would be the first of the several bomb attacks carried out by Islamic militants across the country in 2005 targeting to eliminate the secular forces in the country and especially Awami League in the political arena. The nation remains a long way from proving the accusations in the case of the August 21 grenade attack, Photo: Star File. The first questions that rise after any crime are – who and why. More or less, we have some answers to these questions from the heinous crimes committed on August 15 and 17. But answers remain scarce when it comes to the third incident. Undoubtedly, the gruesome killing on August 21 was one of the most shocking political crimes in the country's history. But what is more shocking is the list of the culprits behind the attack that has come into light after latest investigations. 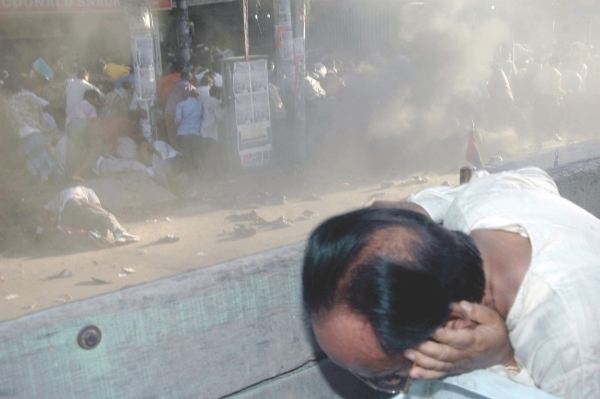 The then Prime Minister and BNP chairperson Khaleda Zia's political office “Hawa Bhaban” was being used to plot the grenade attack. Tarique Rahman, Khaleda's eldest son and the then most powerful leader in BNP after Khaleda who used to run the Hawa Bhaban tops the list of the accused. The other accused include Saiful Islam Duke, Khaleda's nephew and also private secretary during her premiership – and also a former Naval officer; Harris Chowdhury, political secretary of the then premier Khaleda Zia. His former close associates while talking to this correspondent years ago, had termed Harris as a “tiger.” Lutfozzaman Babar, another accused, was running the home ministry at his will as the state minister for Home and was known as very close to Tarique and Hawa Bhaban. Then there is Abdus Salam Pintu, a former BNP deputy minister, who was close to Hawa Bhaban. Ali Ahsan Mohammad Mojahid, secretary general of Jamaat-e-Islami, a major partner of the then government has also been charged in this case. Apart from the political bigwigs, three top police officials from Khaleda's administration who were in important positions during the attack have also been accused. They are Inspector General of Police Shahudul Haque, Dhaka Metropolitan Police Commissioner Ashraful Huda and chief of the Criminal Investigation Department of Police Khoda Baksh Chowdhury. The last two police officials were promoted to IGP before BNP-Jamaat government's tenure came to an end in 2006. It is a common perception in the country that personal loyalty towards the ruling party is more important than performance and professional integrity to get the top post in the police force. Charges have also been brought against some top and mid ranking military officers including former bosses of two major intelligence agencies—National Security Intelligence (NSI) and Director General of Forces Intelligence (DGFI). A traumatised survivor of the deadly attack on August 21, 2004. The list is long with 52 names, the majority being from the banned Islamist outfit Harkat-ul-Jihad-al Islami (Huji), who had been lined up as mercenaries behind the plotters to physically eliminate Hasina along with top brasses of her party. The attempt came 19 years after the assassination of Mujib, his family, relatives and four top leaders in 1975. Only two daughters of Mujib—Hasina and Sheikh Rehana – survived the assassination as they were abroad. Ziaur Rahman, the country's first military ruler, founder of BNP and historically the ultimate beneficiary of the killing of Mujib had not been charged for Mujib's assassination. But beneath the unambiguous killing mission, there remains a grey area in the history about Zia's role at that time. Though Zia's direct role in killing Mujib had not been found, it is historically evident that he had rewarded and sheltered the killers of Mujib in various ways. This year, Zia's eldest son is one of the accused along with many others who are loyal to Khaleda, Zia's wife, for an attempt to kill Haisna who narrowly escaped with an ear injury. But 24 other leaders and party workers were killed in the attack and 300 were maimed. Present president Zillur Rahman's wife Ivy Rahman was one of the casualties in the grenade attack. Interestingly, no significant shows of outrage or protests have been seen from the BNP men even after charges were brought against Tarique, Khaleda's son who is considered as the future chief of BNP. However, only weeks ago some BNP lawyers in a High Court room had flared up after the judges shared their observations about the BNP chairperson's derogatory remarks on the constitution. Tarique, Babar and several other former BNP ministers and lawmakers directly and indirectly patronised Islamist militant outfit Jama'atul Mujahideen Bangladesh (JMB) led by the infamous Abdur Rhaman and Bangla Bhai. 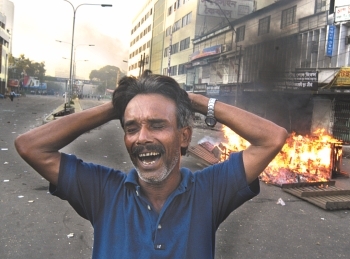 This outfit orchestrated simultaneous bomb attacks across the country on August 17, 2005, which had created serious concern nationally and internationally about the rise of militancy in Bangladesh after having same severe problem in two other south Asian countries—Afghanistan and Pakistan. Khaleda and her government engaged themselves in the politics of denial about the existence of Bangla Bhai and his outfit JMB, though this correspondent himself interviewed Siddiqul Islam alias Bangla Bhai, his mentor– chief of JMB Abdur Rahman and another top leader Salahuddin in May 2004 and took photographs of them as proof of enjoying government support for conducting their operations in northern region Rajshahi. But after blasts of over 450 bombs in 63 districts on August 17, 2005 with an open claim by JMB, the pressure from home and abroad had finally forced Khaleda's government to admit the existence of the outfit and Bangla bhai and launch a crack down on the militants. 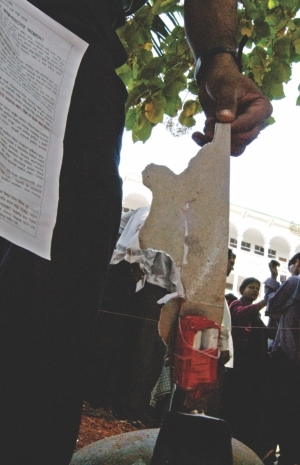 Police recover a live bomb from the Supreme Court premises. It was intended to be detonated as part of the series of bomb blasts orchestrated by the JMB that rocked the nation on August 17, 2005. The attitude of protecting the perpetrators was also seen after the killing of Mujib. Zia had indemnified the killers of Mujib introducing an indemnity law. Later in 1996, though Hasina initiated a move for justice after assuming power, Khaleda's government did not take any steps to complete the trial of the Bangbandhu killing case in the apex court. After a long wait, Hasina finally ensured justice after she came to power after the latest elections. But the twists and turns that came with the probe of August 21 grenade attacks were far greater than any other dirty game in probing and ensuring justice of the heinous killings and attacks. 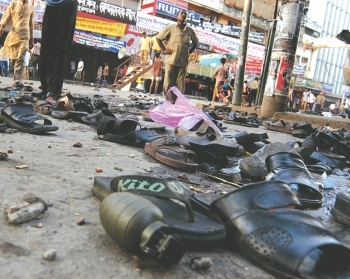 All the past claims and findings of the then BNP-Jamaat alliance government about the August 21 grenade attacks were completely opposite of the revelations from the latest probe, which found that the ruling party stalwarts and law enforcing and intelligence officials were part of the most gruesome terror attacks in the recent past. In the name of investigations, the BNP-Jamaat alliance government tried to establish that the Awami League killed its own leaders and activists in the party rally at Bangabandhu Avenue in 2004 to tarnish the image of the government. Through multiple farcical investigations, the BNP alliance government also tried to prove that "foreign enemies" instigated the carnage and some listed criminals absconding in India had staged the attack. The then investigators also attempted to woo the public with a woven story through an ostensible confessional statement made by a petty criminal Joj Miah. Joj's very weakly woven statement drew media criticism, finally making it appear as blatantly meritless. He himself turned out to be a creation of the investigators' well practiced imagination when his sister revealed to the media that Criminal Investigation Department (CID) had been paying his family Tk 2,500 per month as allowance since the arrest.The police also wanted to weave another story, claiming Joj Miah named Mokhlesur Rahman, a ward-level AL leader and former ward commissioner of Moghbazar in the capital as one of the planners. Apart from Mokhlesur and Joj, 18 others were also arrested and brutally tortured. Based on statements by Joj and two others, all of who had made almost identical confessions, the CID investigators even attempted to submit a charge sheet. But the government held it back following media flak, which criticised Joj's as sketchy at best. When it comes to investigations, all the farcical efforts made by the BNP Jamaat alliance government now stand as a model of moral bankruptcy. For misleading the probes or diverting it in the wrong direction, some of the investigators themselves are now facing criminal charges. These immoral actions have gradually created a serious sense of public mistrust about government findings in any criminal investigations nowadays, thanks to the politics of crime and criminalising the investigations. The nation remains a long way from proving the accusations in the case of the August 21 grenade attack. But it does not mean that Khaleda and her law enforcing and intelligence administration can shun the responsibilities of failing to prevent such gruesome killings. And the most important but suspicious question is why they were so desperate to divert the investigation of the grenade attack. Can we expect an answer from Khaleda breaking the silence about this gruesome attack and its aftermath, who pinned the blame on AL leaders eleven days after the grisly grenade attack? The writer is Chief Reporter, The Daily Star.